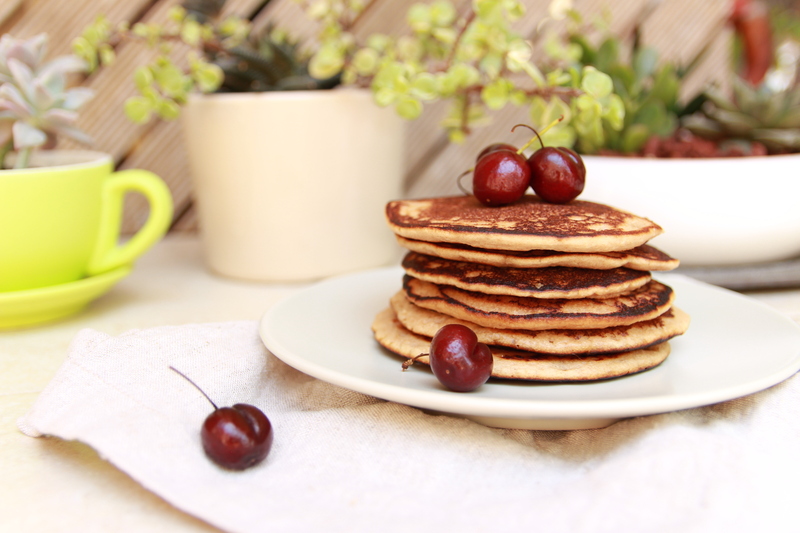 Healthy Vegan Pancakes- The Only Pancake Recipe You’ll Need! 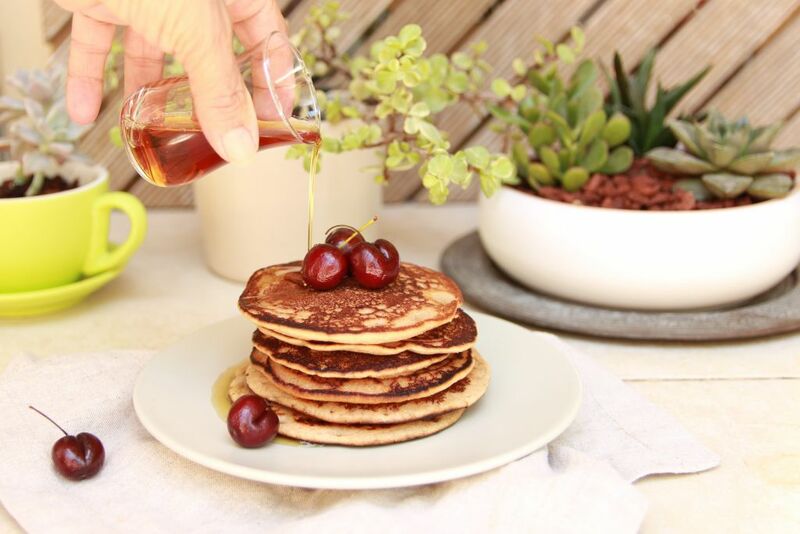 These healthy vegan pancakes are very easy to make, require only 5 ingredients and will be the only thing you’ll want to have for breakfast, for the near future at least. 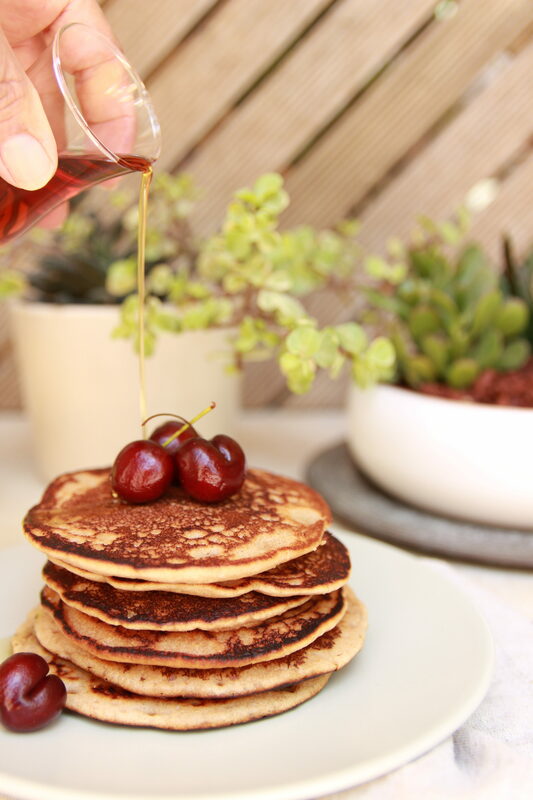 Whether you decide to eat them with fresh fruit, a generous drizzle of maple syrup or on their own you’ll thank me after you make these easy vegan pancakes. Since my Mum came to visit me from Australia, I felt that the both of us deserved to be pampered. Well for me that means pancakes drizzled with maple syrup! Who here agrees? So, I got to work and after a few surprisingly quick tries’ I had a stack of not too sweet, healthy vegan pancakes that tasted heavenly. I asked my Mum to assist me while I photographed them, which she of course happily agreed to do and after a fun photography session we sat down and enjoyed these maple drizzled plant based pancakes. Mix together the almond butter, coconut milk and maple syrup in a medium sized bowl. Add the spelt flour and baking powder and mix until combined. Heat a saucepan on medium heat and when the pan is nice and hot add a drizzle of olive oil. Remove excess oil with a paper towel then scoop 2 tablespoons or desired sized and wait for the bubbles pop, around a minute, until flipping the pancake over. Wait roughly half a minute then transfer onto a plate. Repeat until you have finished the entire vegan pancake batter. Serve with fresh fruit and a drizzle of maple syrup and enjoy! Want another delicious breakfast recipe? 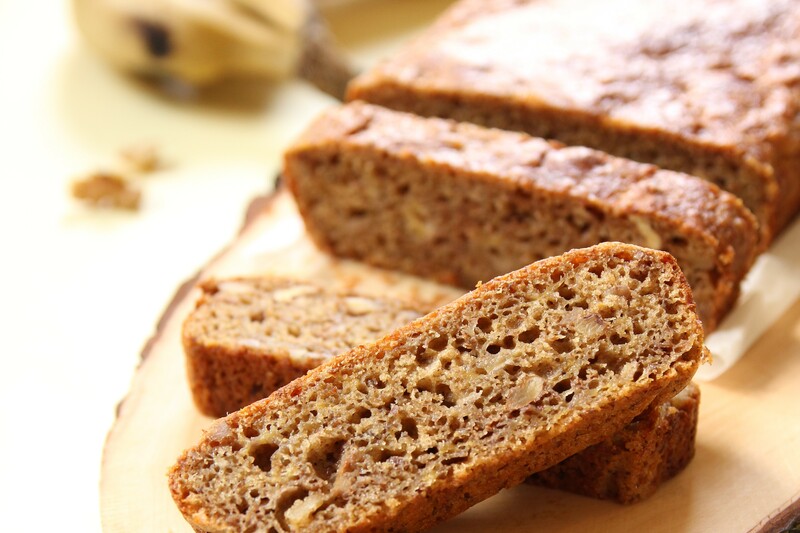 Try my Vegan Banana Bread! It’s easy to make, perfectly infused with lemon and walnuts and makes a great on the go snack. ← Fermented Lemons – A Staple In Your Home! Have you heard any results using GF flour? I am not able to eat spelt flour but these look amazing. What will I need in grams? I’ve tried converting cups to grams before but it never seems to turn out right. America is the only place where they use cups(I think) , so if you want to help your foreign followers it’s a good idea to tell us what we’ll need in grams and milliliters too.